It is sometimes hard to split apart the words 'tradition' and 'old'. Traditions are of course repeated and handed down, often for many years and generations and that is why I think I associate the word with dark colours. Colours that have become weighed down with age and responsibility . They are classic colours that are used again and again. They are respectable and solid. It's Gryffindor red and British racing green. It's noble navy blues and worn brown leather bound tomes. That why that first picture is there, to represent the age and history of tradition. But then what could be more traditional than the pomp and ceremony of royal parades and military regalia? 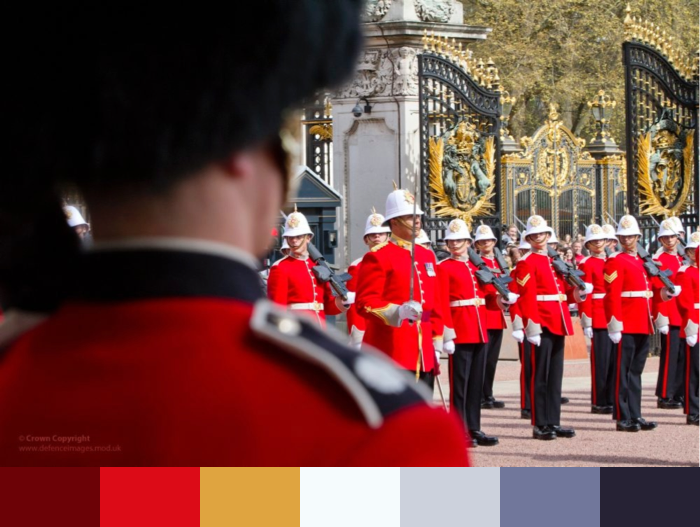 Here we still have the somber navy and and ubiquitous black but we have bright scarlet too and, as this is for celebration, bright shiny silver and gold. 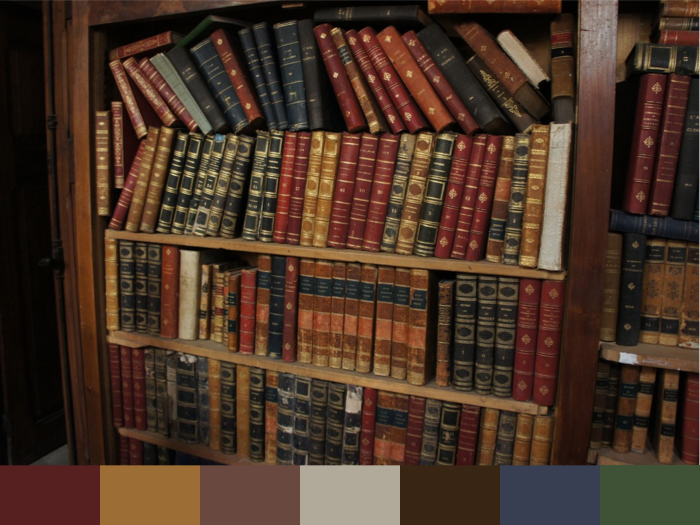 A much brighter palette that the fusty old library feel I was thinking of before. But traditions don't have to be old of course. We make new ones all the time. I always eat one brussel sprout at Christmas, I don't like the things, but a it's become a tradition. It's a word which is often used as a defence. Many things are held onto and continue as they have done because of tradition but what is a tradition, but a routine? Something that has worked before and so therefore gets repeated. Routines are probably a little easier to break than traditions. Routines don't have the weight of history on their shoulders. So, how would I break with routine and use my traditional colours in a new way? I love this palette, even though I'm not usually happy to contain myself to the warmer end of the spectrum. But here I like the perky pink against the aging brown and terracotta colours and the mustard which give the darker colours a lift too. I've always loved a dark green against a pale, teal or aqua blue, ever since I saw the two paired on a beautiful womans outfit in a film long ago. It has a 50's feel to it I think and I love that this palette manages to bring the deep red in too. I wouldn't have thought the deep forest green and the rich red could ever have worked together. Then there is something more surprising. This makes a pretty unusual palette, the dark green is still there, but with a peachy orange and a musty purple. 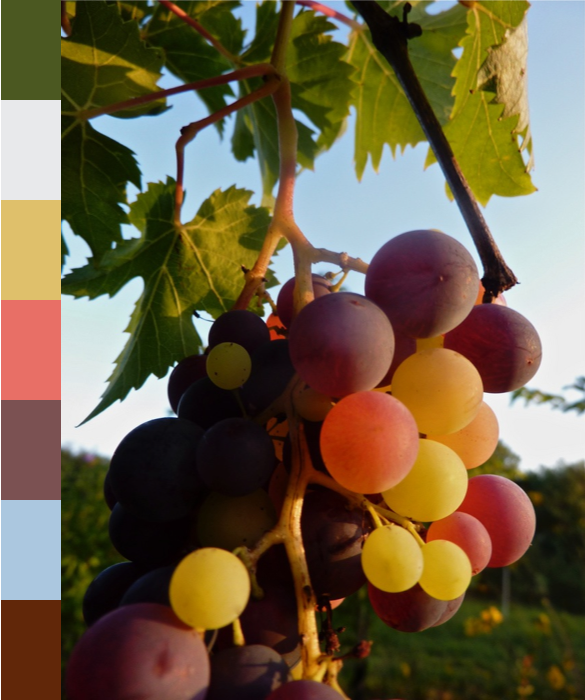 The contrasting pale blue sky and the yellow of the grape are a classic combo and help hold the whole thing together but here are colours I never would have picked out to work next to each other, but mother nature knows her stuff and I shall just look and learn. So, do you have a 'traditional' colour palette that you like to use and would you dare to break out and throw in some new colours? This is really thought-provoking, Sandra. 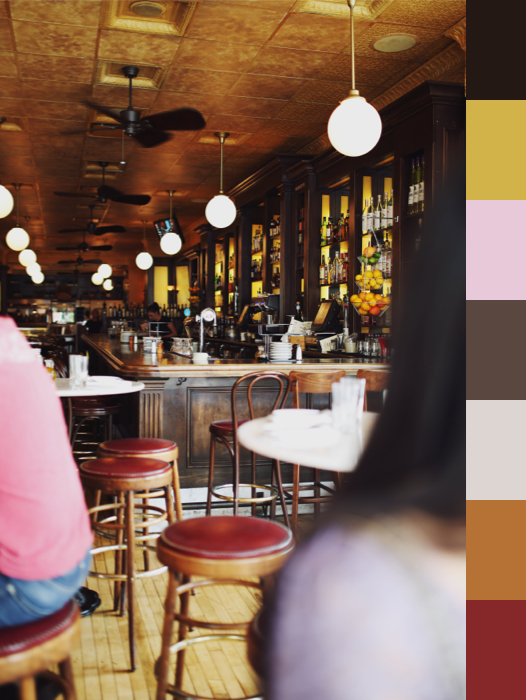 I love your photos and color palettes. My favorite combination, and one I use a lot, is pink with mint green. I choose it for many special occasions, as well as for regular decorating. I've realized that other colors work in this combination too, like a darker reddish-pink or a dark green. I enjoy coming up with color combinations, especially in sewing and crochet projects. How fun! 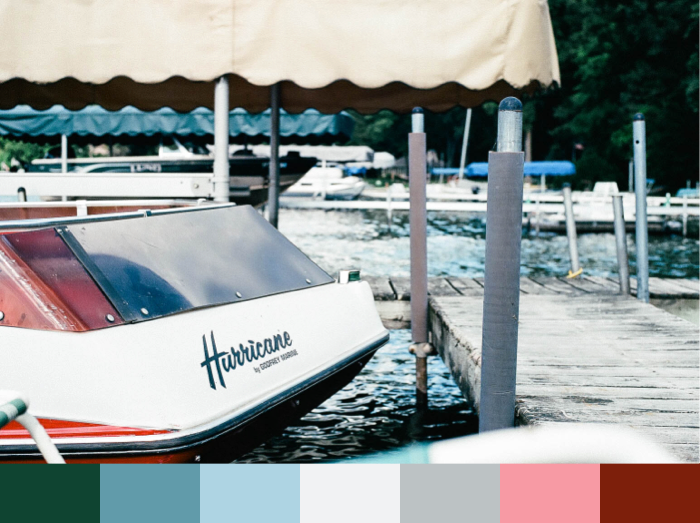 I love these photos and the color palettes. Especially the restaurant/bar and the grape photos. I've never seen a bunch of grapes with so many colors on it. That's amazing! I always enjoy seeing pictures with a color palette from it. It's so interesting and looks like so much fun! What do you use to add the color palette? Is it a website? Cheryl, I can't speak for Sandra's way of doing it - I'm sure she will - but I posted a tutorial for doing something similar with PicMonkey last month as part of the Colour Collaborative. http://knitsofacto.blogspot.co.uk/2014/03/the-colour-collaborative-march-bud.html if that's any help. I do love the traditional colours as I am a lover of Victoriana, however my family are more of the neutral colour type so I have lost that battle! I do get away with the accent tones though through soft furnishings. Some lovely colours in your photos. A lovely thought-provoking post. I discovered a couple of years ago that I always gravitate to greys and blues. It took me a while to realise it! Great to discover your blog, via Annie and Jennifer and I love your Colour collaboration. Have always liked the rich traditional colours. Oops... very long comment! I think this has been more of a stream of consciousness! Another great thought provoking post. I'm not one for the colours in this post mainly because I can't bear that mustard colour, but the palette with the boat is really interesting. And that picture has a real 1950's feel - it makes me think of James Bond and the French Riviera. I tend to use purple and greens. I love a 'pop' of bright green with most combinations. Incidentally it is a tradition when I return home and we have a family meal for me to pass the potatoes to my stepfather with the line 'Potatoes up your end Brigadier? '.......Don't ask! 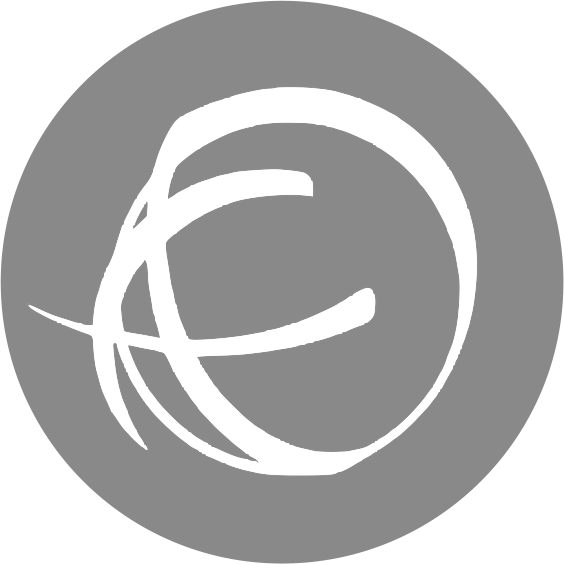 I am so enjoying your blog and the links to the other color collaborative blogs. It never dawned on me that such an idea existed. I found your blog accidentally and am so glad i did. I love putting colors together in my yarn projects and i love seeing your inspirations. Color is one of nature's nicest freebie, isn't it?